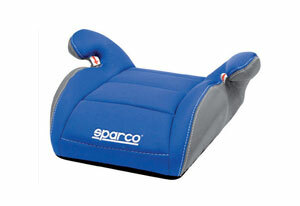 Our car booster seats for toddlers include Sparco. All products are cleaned hygenically and checked for correct operation before hire. The F100K is a lightweight childs booster seat which complies with International safety standards, and is suitable for children between 15 – 30 kilos weight (approx 4-12 years of age). The seat is ergonomic and comfortable and is designed to be used with the vehicles seatbelts. The seat cover if fully removable and washable.